Social media is buzzing with posts from those upset over an unconfirmed report from an anonymous source who once worked with President Donald Trump, who allegedly told the media that Trump wants his female staffers to “dress like a woman” while they’re at work. The outlet Axios released the report on Thursday, which mentioned the president’s presentation preferences for both male and female White House staff. And Trump prefers that female staffers “dress like women,” a source “who worked on Trump’s campaign” said. “Even if you’re in jeans, you need to look neat and orderly,” they stated of the ladies. The report set off a firestorm on social media with both men and women posting photos of various women in everything from military fatigues to space suits to hospital scrubs, criticizing the president’s remarks as being “sexist”—and as if applying to all women everywhere. “Director/producer/writer/academy award winner in her office with a view. I’ll dress how I [expletive] well please, thank you very much. 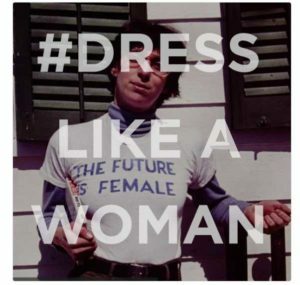 #dresslikeawoman,” Brie Larson wrote, posting a photo of herself in a t-shirt and leggings. “As an #actuallivingscientist, I study the evolution of reproductive systems. And I wear what I want to do it. #DressLikeAWoman,” Tweeted Mercedes Burns. “Hey, @POTUS @realDonaldTrump Does this count? #DressLikeAWoman,” wrote Marie Nina, posting a photo of a women’s hockey team. “Astronaut Jeanette J. Epps is going to the International Space Station and she will #DressLikeAWoman,” Tweeted Jessica Mills. “This is how I #DressLikeAWoman for 9 years #stoptrump,” posted user VickyMassUSMCvet, sharing a photo of herself in a police uniform. “I’m an estuarine ecologist #actuallivingscientist counting fish. What does one wear for this? #DressLikeAWoman,” a woman with the screenname Mint wrote, showing a photo of herself underwater. Some posts generated thousands of likes. As of press time, The White House has not yet responded to the controversy.